Over the past two years, we at Shiny Book Review have avidly devoured every last one of Katharine Eliska Kimbriel’s novels — there are five to date (FIRES OF NUALA, HIDDEN FIRES, FIRE SANCTUARY, NIGHT CALLS, and KINDRED RITES), with a sixth, SPIRAL PATH, currently being polished even as we speak. Put simply, anything Ms. Kimbriel writes is worth the price of admission. 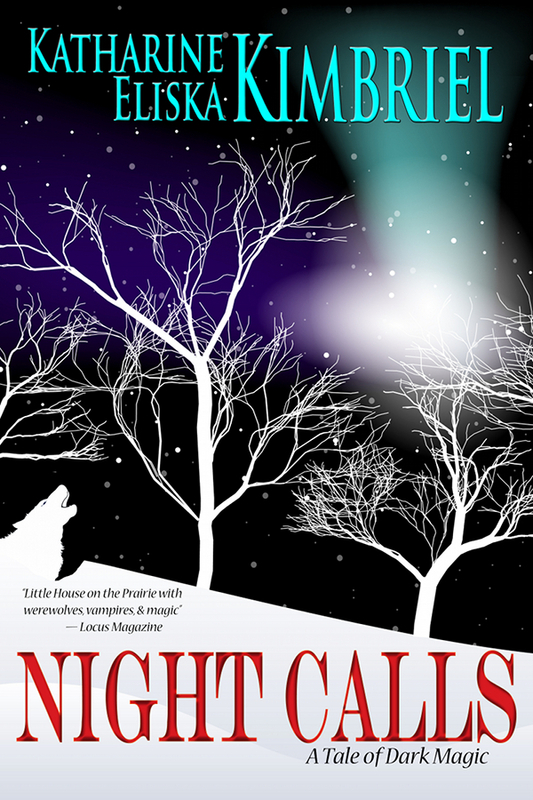 It doesn’t matter whether she writes fantasy or science fiction; it doesn’t matter whether she’s writing a young adult novel, as in her Night Calls series, or if she’s writing a complex and challenging far-future epic clearly meant for adults, as with her Chronicles of Nuala. Whatever she writes is excellent in all particulars. Guaranteed. So, without further ado, please welcome novelist Katharine Eliska Kimbriel! SBR: You’ve written both fantasy and hard science fiction, and your writing has been well-received in both genres. What, if anything, do you do differently when writing a fantasy story as opposed to a SF story? Katharine Eliska Kimbriel: As I mention over in my bio on Book View Cafe, I return to the question of power, and the metaphor is either magic or technology. Who has it, who doesn’t, do they want it, what will they do with it, how were they affected by it? It doesn’t matter if I’m writing tech or magic–I want to know how people are changed by their surroundings, events, and the catalyst–magic or tech. 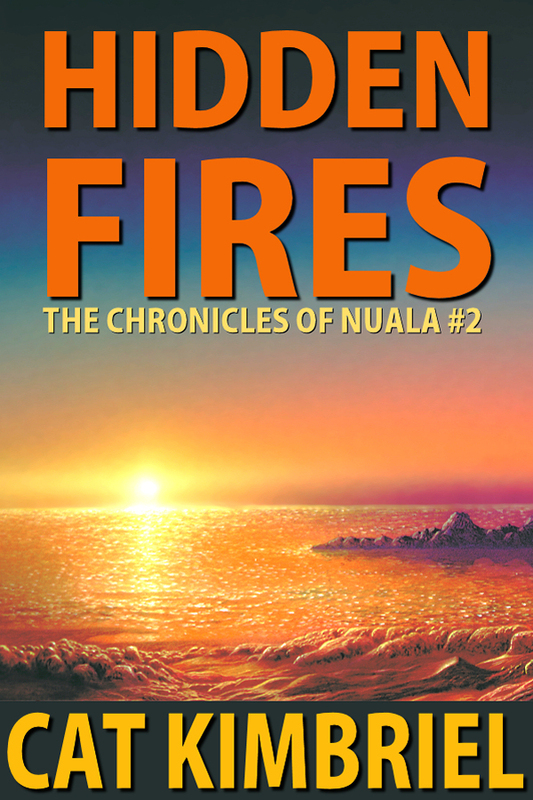 On Nuala, a space-faring group of humans is changed forever by being stranded on a planet where the radiation breakdown is 3x what it is on Earth, with the resultant mutation and sterility factors to overcome. They could dwindle into death, or they could blaze a new path. In my fantasy, sometimes the magic solves problems, and sometimes it makes problems–but the people have to deal with it, while still living their lives and interacting with others, both magical and mundane. I tend not to change a lot, when I create a society–I change a little, making an interesting blend from Earth societies, just to see what will happen. On Nuala, I used three things, essentially–the increased radiation level, the mutated mineral-leeching microbe, and the mutation that amplified the ability to heal, the so-called King’s touch. Little changes can multiply into big things! Katharine Eliska Kimbriel: Two things…I was fascinated by pictures of the huge vegetables growing in the soil around Hiroshima, and the rampant fertility of the soil. I’d also read about wiring a battery to a bone break to speed healing. So I took two questions: 1) What if people could not only survive, but in some weird way, thrive, in a radioactive environment? 2) What if the the concept of laying-on of hands to heal became a reality? Then the story began. SBR: What was your first story sale? How did that lead into writing novels? 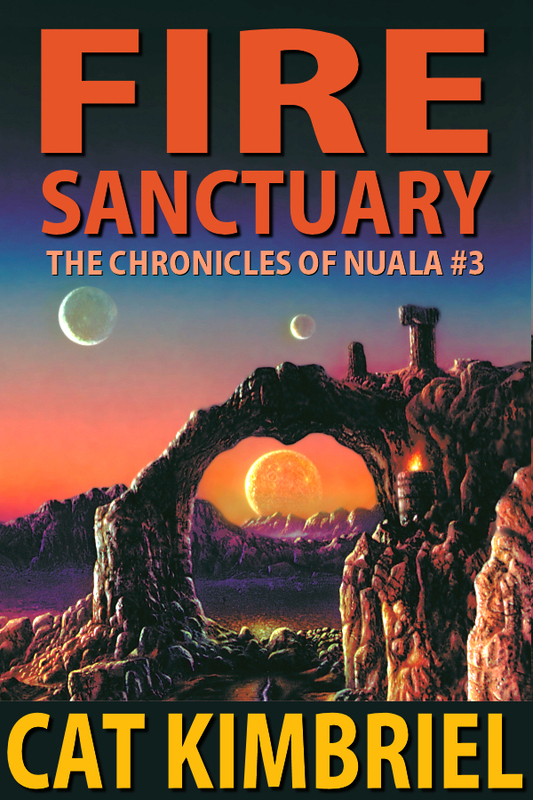 Katharine Eliska Kimbriel: Actually, my first sale was Fire Sanctuary! I sold it to Bluejay Books, an imprint of St. Martin’s, but they never counter-signed the contract (they had no cash flow, and were in trouble) so I’d gotten an agent, who resold the book to Warner/Popular Library/Questar in about a year. Those were the bad old days. We were captive to New York publishing. SBR: How did you come up with your Night Calls series starring Alfreda “Allie” Sorensson? I then had two very sharp images come to mind. First, a young girl in clothing that was not modern–either pre- or post modern–gently brushing away snow to find garlic attempting to root under a window, and a young girl with long, blond braids dragging a chair to an interior door to hang up a braid of garlic. In that first version, Allie was post-apocalyptic, but Kim Moran at Amazing Stories convinced me to place her in the past. Allie was born there. SBR: What sorts of research did you do to add verisimilitude for each series? SBR: How well did you know Roger Zelasny, and what influence (if any) did he have on your work? Katharine Eliska Kimbriel: Roger Zelazny came to several Texas conventions when I lived in the Dallas-Ft. Worth area. I thought he was wonderful, and he decided I was pretty interesting, too. I came up with the book title If at Faust You Don’t Succeed–that was the weekend he was all excited about the book he was writing from the POV of Jack the Ripper’s Dog, one of my favorite of his books, A Night In the Lonesome October. We exchanged letters when his schedule permitted, and had started talking on the phone (we had different networks, which back then was a good thing–we could swap industry gossip!) when he became ill with his cancer. Only very, very close friends, most of them in New Mexico, knew how ill he was…I was ready to come to Santa Fe at that point, but did not hear back from him. Then word went out through the fan networks that he had died, and I knew why I had not heard back. Instead of seeing him, I was writing an elegy for Locus and a sympathy note to Jane Lindskold. I miss him still. He never got to see Allie, he was too ill to read the story. Roger taught me to write short stories as if they were the last chapter of a novel–and a lot about writing dialogue. You can follow his dialog for pages without any qualifiers telling you who is speaking. That helps me remember to keep speech patterns distinct. SBR: How is being published by Book View Cafe different from working with your previous publisher(s)? What do you like about this approach, and do you think there will be more consortiums like BVC in the future? Katharine Eliska Kimbriel: It is collaborative, because as a coop we do everything, and we help with everything. We have a huge forum where there are topics for kibbitzing on cover art, layout, back cover blurbs–we have people currently specializing in everything from ebook formatting to keeping the web site going through blogging and copy editing. There are people shepherding production schedules and volunteers. I could not have gotten my books up without my fellow authors, due to my health problems back in the early BVC years. I hope I have been useful to them. Right now I do everything from woman the events calendar to serve as a member of the board. And as you know, I mention all the great books we bring out. It’s a blessing to me that everyone in the coop is good at what they write, whether their work is to my personal tastes or not. I have no hesitation bringing their books to the attention of my fans, because there’s a chance that some of them may be looking for just that type of book. I do think the producer cooperative model will be a successful one for writers. We are inventing a new way to do business, but we are hopeful and making more money each year, So…forward! SBR: You’ve recently announced (via Facebook) that the third book in the Night Calls series has been finished. How soon will it be available? Katharine Eliska Kimbriel: Well, I’m editing. Once I am satisfied with it, Spiral Path will go to at least one Book View Cafe member for a beta read, because it is an original work. (Also to my cover artist, Mitchell Bentley.) It’s at least a four month lag time from that point. I hope at the end of this week to be able to ballpark it, because I want to send out print copies for review to Locus and possibly Rave Reviews. End of summer, if I can get the lead slot at Book View Cafe? This is possibly Allie’s last chance. I have to make some money from the books, because I spent a great deal of money staying alive. I have to make a living and try to replenish the emptied investment account. So…if not Allie, I will have to try writing something else. In fact, I will be starting a new series, a contemporary fantasy, after this, and also, I hope a fourth Allie book, if she’s still telling me her story. SBR: Ms. Kimbriel, e-books of all five of your novels are available right now. But what about hard-copy, “dead tree” editions? Are they, too, available now? SBR: As an editor, what is your favorite genre to edit? (Or do you like a little bit of everything?) And what is your favorite book that you’ve ever edited, and why? Katharine Eliska Kimbriel: Actually, I don’t have a favorite right now. I love the variety. I prefer fiction, and really enjoy concept editing. I like helping someone find their own voice and where they want to go, and making it the best book their idea can be. I would have liked being a NY editor, but that didn’t happen. SBR: Why didn’t it happen? Katharine Eliska Kimbriel: Becoming a known concept editor who can make a living at it tends to start with a job (working) for a NY publisher. You had to move to NY in those days, and that was something I would not have dreamed of doing when I was first publishing–my husband had a good job in Texas, and Texas was having its first tech boom at that time. Later I was trying to establish a business that would let me write fiction part time, and I was looking for life balance, so I became a clinical massage therapist. Finally, I became ill, and life has been catch-up ever since. So although I have been told by many writers that I am a good concept editor, and my resume tag line is “Writer, editor, and trainer specializing in retaining the authentic client voice”, becoming a developmental editor at this point is unlikely. Katharine Eliska Kimbriel: None of those things hurt. To be a writer, a storyteller, you need stories you are driven to tell (and that may be harder than ever to do, with even more life distractions out there!) persistence, and talent. To be published requires persisting…at the writing, the submissions, or researching how to do it yourself. And then researching how to promote, or not–how to submit the book to a few review sites and let it go, keep writing. Fame interests me only as a medium to reach more readers with my stories. Money, sadly, would be handy–I spent a fortune staying alive, and I must work now, and need a decent income. If the writing cannot pull its weight, then I have to relegate it to a hobby and return to school or take whatever I can find in the current market. I think Alfreda will outlive me, but who knows what future creators will do with her and her tales. I don’t know about anything else I’ve written or may yet write. SBR: One, final question: What would you like to say to new authors? Katharine Eliska Kimbriel: If you have a story that keeps you awake at night, then you may just be a storyteller. Figure out how you want to tell it–book, graphic novel, film–and go for it. No other hobby can compete with creating something unique. Don’t let it be the thing you regret most in life; the thing you never tried. If you have regrets? Don’t let them be your stories. Again, many thanks to Katharine Eliska Kimbriel for consenting to this wide-ranging interview . . . now, go forth and read her books already!